Perhaps I was ahead of my peers, or perhaps I was simply eager and willing to listen to anything that came out of the clandestine Orange County vocal chords of Gwen Stefani, pink hair or no pink hair, but I remember being thoroughly entertained by and fascinated with No Doubt's infamous critical smash and commercial underperformer of a followup to their Diamond-certified smash album Tragic Kingdom. The groovy new wave mid-tempo tracks, eerily glam yet not sonically depressing ballads, and understated up-tempo rockouts to me were both fun listens musically, but also appealing to my late adolescent mindset, which apparently set me on the same plane as the ska band who had until then seemed so young but were in 2000 approaching *gasp* thirty. And my goodness, did that gal want to get hitched...bad (so much so that her subesquent nuptials with singer Gavin Rossdale provided a shared moment of joyful wish fulfillment that No Doubt devotees felt as much as the popular and beloved songstress. Trivia: While Return of Saturn's over 270,000 copies sold in its first week scored No Doubt's second album its highest chart position (#2, surpassed only by N*SYNC's No Strings Attached) and would have left Susan Boyle in the dust long before Ke$ha finally did last month, the album, which went platinum, is still considered a commercial failure. Only one of its four singles even charted on the Billboard Hot 100, and it lost the one Grammy for which it was nominated (Best Rock Album). Shame. 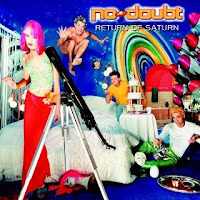 Get No Doubt's phenomenal fourth album Return of Saturn.